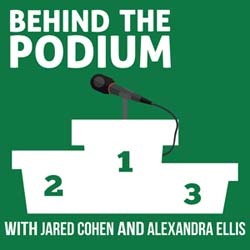 Behind the Podium Podcast | The key to life is being able to personally apply the advice you give to others. Today we are going behind the podium in person at Oak Park Los Angeles, home of CrossFit LA, with Austyn Layne Nealer, who is a coach, master’s graduate of Cal State Fullerton, certified Athletic Trainer, cockroach hater, runner, yogi, CrossFitter, blueberries enthusiast, beachgoer, coffee zealot, reggae fan, lavender-flavored kombucha drinker, runner, sister, healthy skeptic, rope climber, and, last but not least, a student of mine at Oak Park. Specifically, this guest of ours is one of the Athletic Trainers at UCLA for Rowing and Women’s Tennis. She has previously worked with USA Soccer’s National Team Development program. Her specialties include ACL screening/prevention research, post-activation potentiation, and assisted sprinting research. This episode is sponsored by Procabulary – learn how the words you say and think can upgrade your life with the Core Language Upgrade. New language can uncover possibilities and opportunities to help you break through old patterns. Use the code “podium” at checkout to save $100. Today we are going behind the podium for a second time with Elizabeth Wipff; coach, teacher, mentor, meditator, competitive Olympic Weightlifter, Yoga Tune Up teacher/teacher-trainer, movement-mobility specialist, CrossFitter, dancer, theatre arts graduate, singer, straight-shooter, anti-bullshitter, quote-collector, wife, and life-long searcher. Specifically, this guest of ours has been coaching and teaching nationally since 1999 and has presented trainings and workshops at Kripalu Center for Yoga, YogaWorks studios, and CrossFit boxes throughout the US. Currently, her coaching is specifically focused on empowering fitness professionals to dream big and helping those professionals to tactically go after those dreams. What began as If X Then Why is now THRIVE: Business Building for Yoga and Fitness Professionals. This guest of ours was originally featured on episode 6 of Behind the Podium. 2 years and 60 episodes later, we are thrilled to welcome Elizabeth Wipff back to unpack the latest in her thinking and feelings about the struggles, philosophies, and practices of her coaching endeavors. Today we go behind the podium with Jason Von Stietz. He is a coach, Doctor of Philosophy in Clinical Psychology, Sports Psychology consultant, neurofeedback technician, sumo wrestler, an avid supporter of house Stark, weightlifter, recipient of the student-athlete of the year award from his high school, husband, and father of three cats—Penny, Cowboy, and Mimi. Specifically, this guest of ours helped bring a sports psychology presence to the Major League Baseball Youth Academy in Compton, Los Angeles Valley College, and Whittier College. He has had the opportunity to act as team consultant to several collegiate teams, consult with coaches on mental health and sport psychology issues, facilitate concussion protocols, and work with individual athletes on mental health and performance issues. In the fall, our guest will begin as a Post-Doctoral Fellow at Whittier College Counseling Center. Additionally, he acts as a Psychological Assistant at CBT center of Southern California. Today we have Rob Wilson. Rob, with his wife, co-owns CrossFit Virginia Beach. He has over 15 years of experience as a manual therapist both as a practitioner and a teacher, a very robust background in martial arts, and is a part of our previous guest, Dr. Kelly Starrett’s, MobilityWod Team. Rob is also the head coach of Power Speed Endurance’s Breath and Tactical programs. Our other guest today is Brian Mackenzie—the Creator of Power Speed Endurance. Power Speed Endurance is a programming, coaching, and educational platform for developing sports performance, fitness, and health. Power Speed Endurance is also the name of Brian’s first published book, he has also co-written Unbreakable Runner, and Unplugged. Brian is a human performance iconoclast and forever dabbler—From CrossFit Endurance to 3Fuel Protein to heat/cold exposure and breath work to what will soon be a state optimizing smartphone app created alongside Neuroscientist Andrew Huberman. This week, Jared and Alex chat about Jared’s recent experience with The Art of Breath seminar. The Art of Breath is a program developed to give participants an experience-based understanding of how breathing can affect both short-term performance and long-term health. Breathing is the new wave of training – you’ll learn about this awesome new course presented by Power Speed Endurance and get a better understanding of how and why you’d utilize this in your own training. Why breathing and the benefits and how we can use it in training. Today we are going behind the podium with Ryan Smith, a coach, doctor of physical therapy, gym owner, soccer player, wrestler, CrossFit coach, alumnus of Ohio State University, former bartender of Figlio Wood-Fired Pizza, a self-proclaimed bookworm, craftsman, vivacious learner, and all around genuine good dude. Specifically, our guest is the Chief Operating Officer, Head Coach/programmer for Recharge HoCo CrossFit. As a physical therapist, he specializes in treating individuals who participate in CrossFit, Olympic Lifting, Powerlifting, and other recreational sports activities. Most recently, this guest completed the 10-day craftsmanship workshop at Oak Park Los Angeles where I, personally, had the pleasure of getting to work and go surfing with him. How to help your clients be autonomous with their bodies and movements. Why it’s important to test your body to see what you can do. Why gradual training is important whether you are an athlete or not. It’s a solo episode this week! Jared and Alex dive into a conversation recapping what they’ve been studying, thinking and doing over the last few months. To be able to connect with students and clients on a deep level, an interplay of seriousness and playfulness is required. Our guest today is a magician at both. We chat with Emily Peterson, a coach, Rock n Roll enthusiast, Yin Yoga teacher, master Reiki practitioner, TimBO facilitator and teacher trainer, cat lover, elephant lover, former gymnast and competitive volleyball athlete, alumnus of University of Illinois-Chicago with a BA in applied psychology, professional space holder, and aspiring backup dancer for Neil Diamond. She is a certified 500-hour yoga instructor, Usui Reiki Master, and licensed TimBO (trauma-informed mind/body) facilitator and trainer. Her path to yoga began as a way to get out of pain. And since then has blossomed into being a vessel for practicing meditation and experiencing a safe connection to her body, which was transformative and led to personal healing from an eating disorder, depression, and trauma. Along with our previous guest Laura Ahrens, Emily can be found teaching at Coolidge Corner Yoga in Boston, MA. On today’s show, we chat with Dr. Sarah Court, who has been both a mentor and personal friend to us both. Dr. Sarah is a coach, Yogi, Yoga teacher, Yoga Tune Up Teacher Trainer, Doctor of Physical Therapy, Princeton University Alum with degrees in Art and Archeology, Herder of Clinical Pearl, and facilitator of further studying, playing, and mending. Sarah is the creator of Quantum Leap, an advanced training for movement teachers to become biomechanically brilliant. Additionally, she is one of the co-creators and teachers of Movement Logic, which also includes our previous guest Trina Altman and Laurel Beversdorf. Movement Logic, similar to Quantum Leap, provides movement teachers with a reasoned application of movement therapy skills to broaden their clientele. When not traveling the world teaching, Sarah can be found practicing physical therapy at Postureworks in Santa Monica. Pain isn’t always a bad thing – it keeps you safe, warns you of impending danger, and keeps you off areas as they heal. But pain certainly impacts performance and your ability to show up in the world. On today’s episode, we are going behind the podium with Roeshan Shadravan, a coach, snowboarder, bodyworker, educator, skateboarder, teacher trainer, climber, surfer, gymnast, traveler, doctor of osteopathic medicine, and holistic healer. Roeshan is the founder of San Diego Pain and Performance in North County San Diego. At San Diego Pain and Performance, she uses a full spectrum of therapeutic techniques to address the root cause of disharmony and miscommunication in the nervous system, joints, muscles, and the connective tissue system of the body. Additionally, she is a MELT Method practitioner. MELT is a self-massage technique that lengthens and heals connective tissue. In this show, Jared Cohen and Alexandra Ellis (and guests) discuss the struggles, philosophies, and evolving practices of coaching—being a coach, having a coach, and or any avenue of providing value to another individual that advances his or her life. While we hope to answer some questions – the key to learning and growth is continuing to ask better questions (a la Gil Hedley)! Keep tuning in in order to get answers to your current questions, spark new questions, and continue to refine your coaching and leading skills. The best coaches cannot do it alone. This podcast hopes to cast a larger net over those coaches interested in the nuances of putting theory to practice. We respect your privacy. Your email will never be shared. Live ever. We pinky promise.